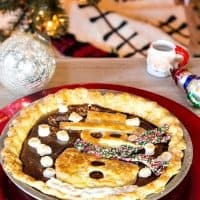 Here’s the recipe for the Mexican hot chocolate pie with the basic instructions for making the applique. If you need to, re-read the first page for more specifics. If you are not feeling crafty, leave it a plain, one crust pie. It’s a seriously flavorful recipe–not just brown pie hiding behind a cute crust. I promise. And here’s a long pin for you if you’d like to save this guy on Pinterest. If not using store-bought pie crust, I recommend Stella’s Pie Crust Recipe from Serious Eats. Easy, flaky, delicious! 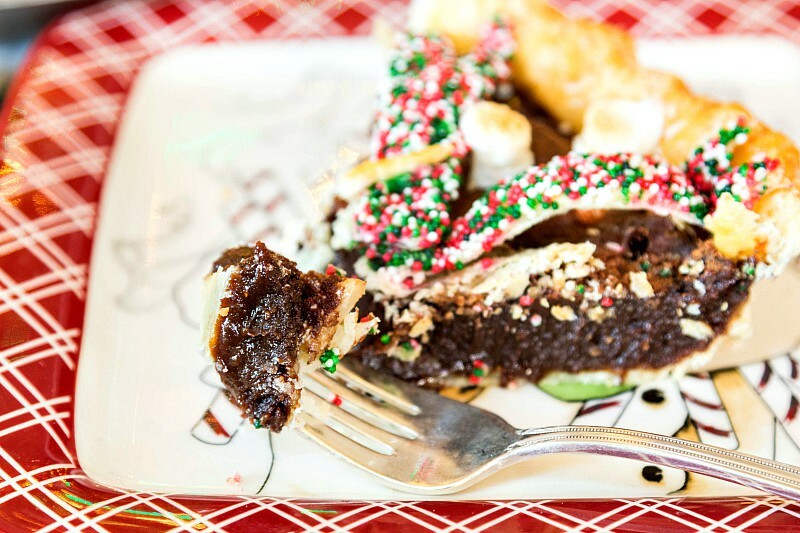 This Mexican Hot Chocolate Pie is absolutely decadent and delicious. 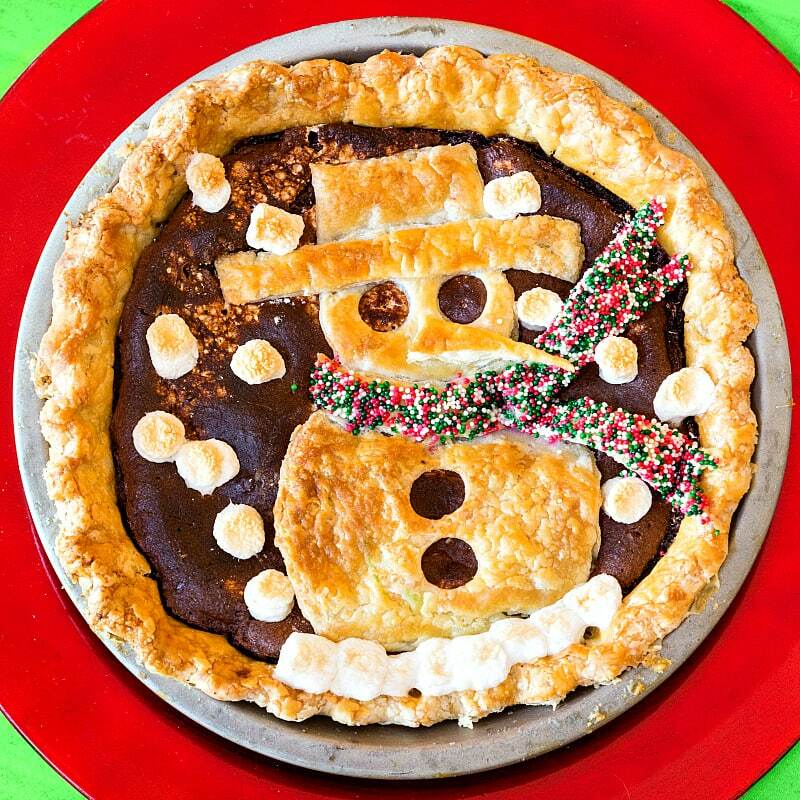 Add to it the cute snowman crust applique, and you have a holiday classic! You can use store-bought crust for this. You'll need 1 crust for the bottom and about 1/2 of another for the applique. 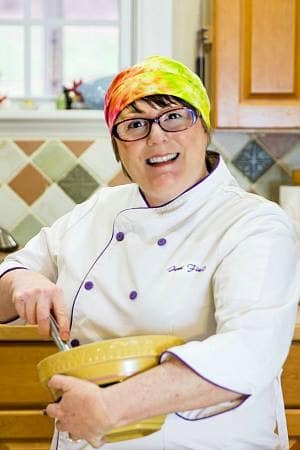 I made Stella's recipe from Serious Eats, , linked above the recipe. So good, and you don't need a recipe since the formula is so easy to remember. Preheat the oven to 350F and set a rack in the middle of the oven. Place a baking stone on the rack. Line a 9" regular pie pan with one of the crusts. Trim to within 3/4 inches of the edge of the pan. Fold excess underneath to make a double thickness and crimp however you like. In a large bowl, whisk together all the filling ingredients until smooth. With a small offset spatula, spread the marshmallow cream in a thin, even layer across the bottom of the pie shell. It may fight with you a bit, but don't worry. You will win. I know it. Pour in the batter evenly on top of the marshmallow cream and shake the pan a bit to level it out. Brush the crust with egg wash.
Place the pie in the oven on the stone and set the timer for 25 minutes. While the pie is baking, cut out all your pieces. First, roll your dough a bit to make it fairly thin. For the snowman, you'll need a large circle and a smaller circle, a rectangle shape for the hat, a long, skinny rectangle for the brim, a triangle for the nose and 3 free-form pieces for the scarf and "tails." If using sprinkles, pour them out into onto a small plate and brush each piece you want covered in sprinkles in egg wash. Then press the pieces, egg wash side down, into the sprinkles so they adhere. Cut out eyes and buttons with the back of a piping tip. You can also glue on circles rather than cutting them out. Your call. Attach the pieces together with water. Leave the scarf tails to be placed after you place the snowman. When the timer goes off, carefully remove the pie from the oven. Place the applique using a large spatula. Attach the scarf tails with a bit of water. Put the pie back in the oven and bake until the pie is well risen and firm, another 20 minutes or so. Add mini marshmallows for snow if you'd like. Let the marshmallows melt on the pie for a minute or two and then put them under the broiler for a minute until they puff up. And there you have it! How cute, right?! 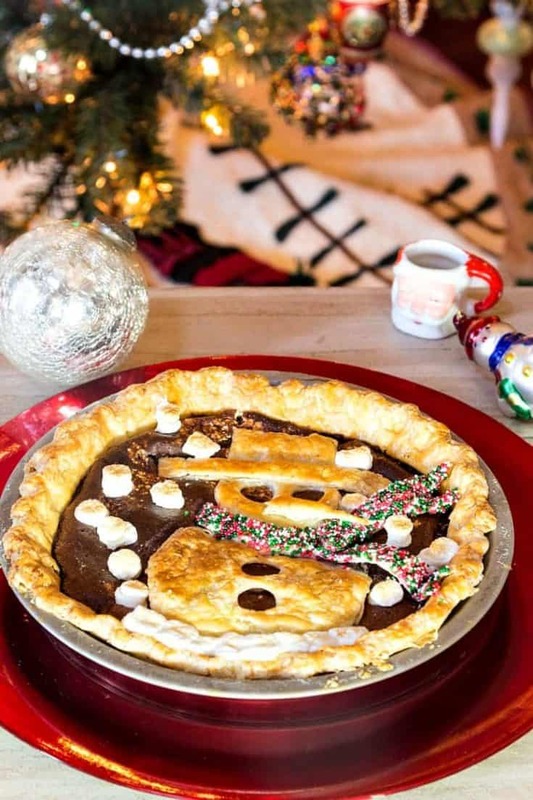 I really do hope you enjoy this Mexican Hot Chocolate Pie, whether or not you do the applique. And remember, you can make whatever design you want, so don’t feel like you have to make one that looks just like mine. If you do make this pie, or use the applique technique to do your own thing, I’d love to see it. Just tag me in your photos on instagram. If you have any questions, don’t hesitate to ask in the comments. Thanks for taking the time to read today. Take care, and have a lovely day. And yay, pie!